Shoulder pain can come from a number of sources, include trauma by way of fracture, tendon rupture, dislocation, muscular tear. However the most common types are from chronic problems. These are where the patient complains of difficulty sleeping at night on their shoulder, they mention waking up suddenly or having difficulty stretching out to pick up an object. 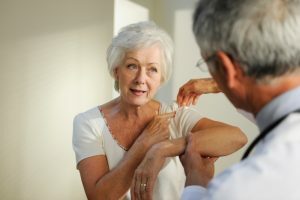 The symptoms associated with this type of shoulder pain include shooting, sharp, burning, throbbing, or stabbing pains that can be either intermittent or constant. You may also get referral (pain which travels further from source) pain to the arm or back, it may also move to the neck. You may also in some conditions feel numbness in your fingers, pins and needles, tingling or weakness in your arm.